On a Sunday I occasionally feel the need to bake enough cake to feed all of my neighbors. I have a few different cakes that I have mastered now so thought I would share them with you. I also have a few variations, which you will love if you are anything like my mum who hates to bake, but does it when she has to. I always find that the best way to test if your cake is cooked or not, is by pressing your finger down on the center of the cake and seeing if it springs back. If it doesn't give it another 5-10 mins. Another way to test if your cake is thoroughly cooked, is by pushing a knife through the center of the cake and pulling it out again. If the knife comes out clean, then your cake is ready to be served. In the winter it is great to serve this cake hot with a cup of tea or coffee. But in the Summer you can always add some cream or ice cream with some mixed berries on the side. Cheat: if you want to cheat with this cake, or you haven't got a lot of time/money, then you can always grab a tesco cake mix and chocolate fudge icing in a pot. The real way tastes a lot better though I promise. Two multi-packs of Kitkats and any topping you would like to put on the cake. I always find malteasers work best, but you can pick anything you like. Not too long ago, I entered this particular cake into a competition and it came third place. So we took it back to the office and sold each slice for £2. So if you have a bake sale happening at work, or maybe even a colleagues birthday, this cake is always a winner. 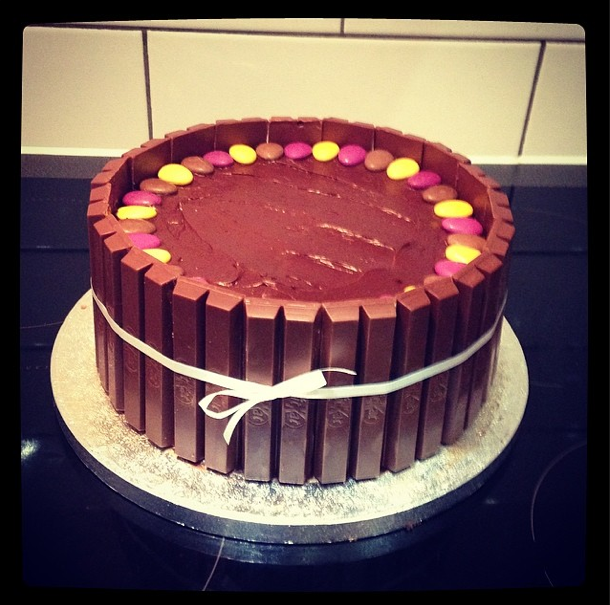 You could even be super mum and make this one for the next bake sale at school - now that would impress the PTA! But I have some much cooler ideas than this one to make at school that the kids (and adults) will LOVE. Happy baking guys, let me know how your cakes turn out.